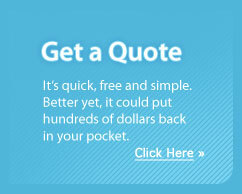 Get a quote on coverage today! In order for us to provide an accurate insurance quote, please select the type of insurance you are requesting from the dropdown on the Get Quote page. In doing so, you will only be asked for information required to accurately quote the insurance product requested. Please do your best to answer the entire form. This will greatly help us place you with the best coverage at the best possible price. Should we have any questions, or if there are any questions on the form you were unsure or unable to answer, we will contact you as necessary. We hold your privacy in highest regard. The information you provide will only be used to allow us to precisely quote your insurance and fulfill our obligations to provide you a quote. We do not and will never provide or sell your contact and personal information. You are not at any time obligated to purchase insurance as a result of this form. However, as a result of our estimate, we hope you consider choosing Diederich as your insurance provider.